By Sean Jones: WBO junior middleweight champion Jaime Munguia (29-0, 25 KOs) and mandatory challenger Liam ‘Beefy’ Smith (26-1-1, 14 KOs) have reportedly reached an agreement to avoid a purse bid for a fight that will be taking place in July in California, according to BoxAzteca7. Having the fight in California rather than the UK will favor Munguia, who will have a lot of new boxing fans coming out to see him. Munguia’s recent destruction of WBO junior middleweight champion Sadam Ali turned him into a name overnight. Munguia captured a wealth of new fans from that performance. Now it’s chance to capitalize on that by showing them that he’s for real by beating the 29-year-old Liam Smith in July. If Munguia can do the same thing to Smith that he did to Sadam Ali, he’s going to be on his way to becoming a star. Munguia needs to get thus fight out of the way before he looks to take on the fighters that he wants to face. Smith is a former WBO junior middleweight champion, and he can be tough at times. Only has one loss on his 10-year pro record, and that came from a loss to Saul Canelo Alvarez. Most of the other fighters that Smith has fought have been C-level fighters, who lacked the talent to beat him. Munguia is far and above the talent level of the typical opponent that Smith has faced in his career, so this should be an interesting fight. 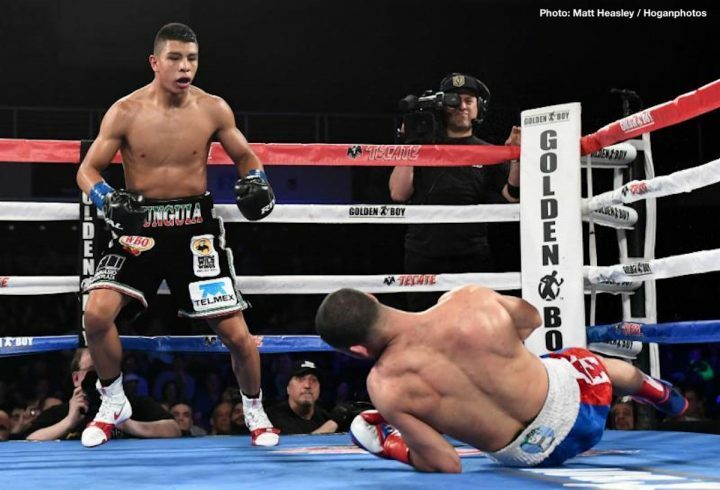 This will be the 21-year-old Munguia’s first title defense of his World Boxing Organization 154lb title that he won last month on May 12 on HBO at the Turning Stone in Verona, New York. Munguia took the fight as a late replacement opponent for Liam Smith, who had pulled out of the fight because of an allergic skin reaction. Munguia smashed WBO junior middleweight champion Sadam Ali in beating him by a 4th round knockout. Munguia knocked Ali down five times in the fight before it ended in the 4th. Sadam got up immediately after being knocked down for the second time in round 4, but the referee Gary Rosato stopped it anyway. Five knockdowns were enough for the referee to stop the contest. Munguia has been talking of wanting to fight the top dogs at 154 and 160. Munguia specifically mentioned wanting to fight Kell Brook, Jarrett Hurd, Jermell Charlo, Gennady Golovkin and Saul Canelo Alvarez. Liam Smith has been a lower priority for Munguia, who hasn’t been nearly as eager at fighting him as he is about Canelo and Golovkin. Smith, 29, lost his WBO junior middleweight title to Canelo Alvarez in getting stopped in the 9th round in September 2016. Smith has gotten back to his winning ways since then in twice beating Liam Williams and defeating Marian Cazacu. Smith, 5’9 ½”, is about the same height as the 5’9” Sadam, but he’s a more solid at the weight. Sadam rehydrated to 169 lbs. for his fight against Munguia, who weighed rehydrated to 170 lbs. Smith typically rehydrates to the low 170s. Munguia won’t have a weight advantage over Smith. The advantages that he will possess will be his immense punching power, youth and talent. Munguia is the much better fighter, but he’s facing a seasoned pro in Smith. This is a wily veteran, who likes to cover up and wait out his opposition sometimes before going after them in the second half of his fights after they tire. If Munguia fades, he will have likely have inflicted a lot of punishment on Smith. It’s hard to imagine Smith being able to take Munguia’s heavy shots for more than 5 or 6 times without going down once or twice. Canelo Alvarez dropped Smith in the 7th and 8th rounds and then a final time in the 9th. Canelo isn’t as big a puncher as Munguia. There’s no comparison. Canelo is a faster puncher, but he doesn’t have the same power that Munguia possesses. The large 6’0” frame of Munguia helps him generate a ton of power on his shots, which makes it difficult for his opponents to take it. Munguia plans on being a busy champion like Gennady ‘GGG’ Golovkin at middleweight. The Kazakhstan fighter showed that the best way to become a star quickly in boxing is to fight frequently, 3 to 4 times per year so that the people can see him. If HBO will be televising Munguia’s fights in the U.S, he could get to where Golovkin is now within half the time as long as he keeps winning. The guys that Munguia wants to take on – Jermell Charlo, Kell Brook, Jarrett Hurd, Golovkin and Canelo Alvarez – are going to be tough for him to beat. If Munguia can add a few of those scalps to his resume, the sky’s the limit for how far he can go. Munguia is reportedly co-promoted by Golden Boy Promotions, but I believe he only has one fight left with them. So, it’s unclear whether Munguia’s fights will be televised on HBO or another network once his co—promotional deal with Golden Boy expires. You would have to imagine that HBO will want to sign Munguia to a contract if he destroys Liam Smith the way he did with Sadam Ali. Canelo didn’t destroy Smith. That was a very hard fight for Canelo until Smith gassed out after four rounds. In the first quarter of the contest, Smith was taking the fight to Canelo, throwing massive amounts of shots and keeping the Mexican star pinned to the ropes the way GGG did. The difference was Smith was firing power shots at Canelo and not just jabbing him the way Golovkin was. Smith looked very good in the first four rounds. If Munguia goes after Smith in the early going, it’s going to be like two rams butting heads. It’s doubtful that Smith will want to start fast against a puncher like Munguia like he did against Canelo, because there’s much more risk for him and he obviously knows that. Whatever happens in the fight, it’s going to be fun for the boxing fans that tune in to see it.